Browse: Home / Linux backdoor implementation written in Python. Linux backdoor implementation written in Python. A backdoor is perceived as a negative vulnerability because it allows an attacker to obtain access to a victim’s machine without proper credentials. However, a backdoor is more than just a tool of exploitation. Generally speaking, the purpose of a backdoor is to allow access to a machine, implemented into the program by the programmer. This is without a doubt a security flaw, however, it is also a tool used for debugging and analytical purposes. This assignment demonstrates a backdoor program where the attacker is capable of executing shell commands on the victim’s machine and returns the response to the attacker. + Backdoor must camouflage itself so as to deceive anyone looking at the process table. 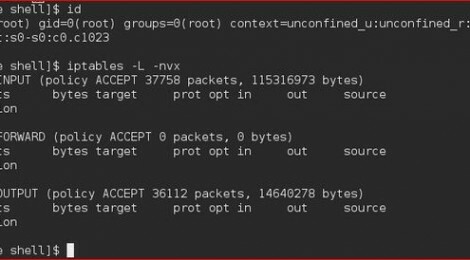 + Application must ensure that it only receives (authenticate) those packets that are meant for the backdoor itself. + The backdoor must interpret commands sent to it, execute them and send the results back. + Incorporate an encryption scheme of your choice into the backdoor. 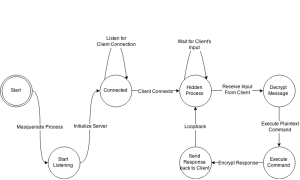 The client (attacker) program establishes a connection to the server (Victim) and will be able to execute Linux commands against the victim’s machine. The messages will be encrypted using the AES encryption scheme while sending data to the server. 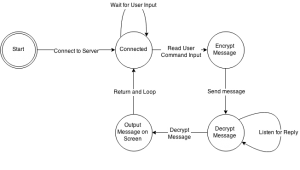 When the victim sends the message back to the client, it will be encrypted once again; hence, the message will be decrypted to plaintext. data, again with AES, and transmit the data back to the client. the user to execute linux commands on the victims machine. 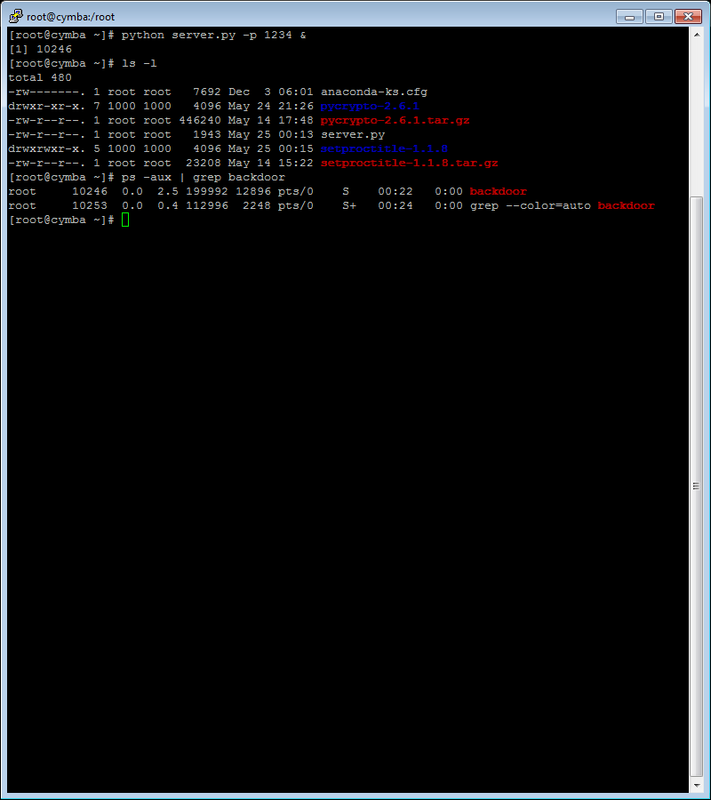 The program will output the executed command given by the victim. secret = "sixteen byte key"
outputs the response back to the client. ← scepwn-ng : A winexe/psexec wrapper to use sce and a msfvenom generated payload on a target system.